One of the fundamental truths of contemporary life is that objects are getting smaller and human beings are either remaining about the same size as always or are getting bigger. It’s equally true that the musty adage that less is more has taken on the heft of a religious belief and invaded the brain of every company manufacturing computers and computer accessories. I have a couple of Bluetooth keyboards here that prove the point. The result of this infatuation with smallness is that more products are coming on the market designed primarily for adults with the fingers of a 4-year-old. You don’t have to be Leonardo da Vinci to realize that human anatomy is basically a study of proportions, and an adult with fingers that belong on a 4-year-old is not a typical specimen. The marketplace for mini-adults with tiny digits is very small. But this stuff sells nonetheless. I’m not talking about the hardware under the hood but the parts that require actual interaction with a human being. There’s clearly a population that continues to buy objects with switches and ports they can’t even see. These are the iconic products of modern day gadget freaks. They’re hard plastic, “leather-like” or faux this or that, and you can operate them easily only if you’ve had lots of experience with dainty teacups and Saturday morning origami classes. If you like the feel of a carpenter’s framing hammer, you’d better go back to your cave and forget these teeny keyboards. They’re smaller than your belt sander. There are many obvious arguments in favor of the trend toward miniaturization. But smaller is not always better, especially when the product ignores human anatomy and the basics of evolutionary biology. The two Bluetooth keyboards I recently received are a case in point. One is called the Zippy BT500 and the other is called the Genius LuxePad. Each is adequate in its own way, which is to say they do what you’d expect. You press the D key, you get a D; you press the Spacebar, it creates a space. You can make smiley faces all day long and nothing will break. Both keyboards pair easily with my iPad, MacBook, and iMac, as they should. 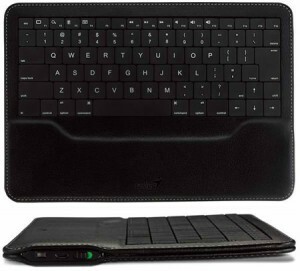 We expect that kind of basic functionality in any product that calls itself a Bluetooth keyboard. But if you go beyond the basics you sometimes find, as I did, that these keyboards demand more of you than you demand of them. Both of these keyboards, for example, expected me to be a very small, well-coordinated, patient individual. Not only that, the Zippy (which I happened to like) wanted me to be a small person who likes Windows products. 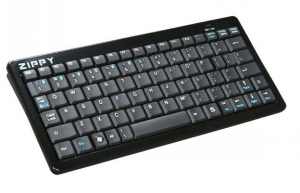 This is a Windows keyboard. No Command or Option keys — you have to substitute the Alt key for Option and Control for Command. But size and weight are the real issues here. The Zippy BT500 is 8.8 inches long and 3.8 inches wide and a little less than an inch high. That’s a crowded neighborhood for the whole alphabet and a bunch of function and punctuation keys. I admit I like the feel of the keys, which remind me of the kind of tactile feedback I used to get from IBM keyboards 30 years ago. It also helped considerably that the keyboard has legs so you can type on an an inclined plane. The size (a little bigger than a giant Hershey Bar) and weight (10 ounces) make the Zippy very portable, but the scrunched keyboard had me writing Latvian that was supposed to be English. I spent more time correcting my typing than arguing with the platitudes that kept popping into my brain. Not good. Theoretically, the LuxePad should have been easier to use because it’s a full-sized laptop keyboard with useful function keys. You can pair it with your iPad and use the function keys to bring up a browser or Spotlight and control volume and movement between tracks in iTunes. Nice. There’s even a thinly cushioned pad where you can rest your hands while you type. However, this keyboard is thinner and flatter than some pancakes I’ve eaten. If you buy into the less is more nonsense, you may be very happy. Certainly you’ll never throw out your back out carrying this keyboard on a plane. It weighs 9 ounces. Nevertheless, I found it as distressing as a conversation about patio furniture. I thought, if I could play the piano like Horowitz, this would work. My hands and fingers would float above these black leatherette keys and each digit would bow precisely and elegantly to just the right key and there would be none of this Celtic-Punjabi gibberish tumbling across the screen. But I’m not Horowitz and anyway I doubt he’d do any better if he had this light, wafer thin keyboard bouncing on his lap. Here’s an e4xamp[le opt what I end up wityhg ifI type art my normal pave using the LuxePad on a flat surtfacv er,. Well this is actually p[ere3tyty good compared ty wqghat I erndedf up with overt the weekend. Ofg courtier, I could go slower and then the terxct looms less like Czech and more like Fr45encvh. What?